The first ever Mutant Shorts Filmmaking Event was held in June 2009, and thankfully, was quite a success. Participants were given one week to make a film after receiving a theme by email. The theme was ‘Inbetween Spaces’ which may sound rather obscure but resulted in a number of inventive shorts. The final two screenings were of a sci-fi/fantasy nature. One, entitled Steve, included a wizard, numerous dimensions and a troubled young man, with the director Rory O’ Reilly taking on almost all of the roles. The final film of the night was our own short, The Outer Zone which comprised a mad scientist, a not so mad scientist and one daft looking machine (hand made). ‘The Outer Zone’ was created by Catherine Crowley, Fiona Riordan, Gemma Mc Carthy, and Keith O’ Connell, who also wrote the script, and it starred Cian Daly and Catherine Crowley. There was, of course, a winner, as judged by Moray Bresnihan of MutantSpace and Dan O’ Connell of Egomotion, and this summer the prize went to Untitled 1 by ‘Outside the Box’ productions, with Last Chance taking a runner up position. 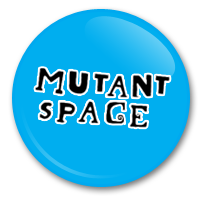 A synopsis of the 2nd Mutant Shorts competition, and the first in the Rooms Series which took place in November ’09 can be found here.